As dayparts continue to blur and snacking increases, consumers now order desserts independent of an entree. Snackable desserts call for nontraditional portion sizes and flavors. 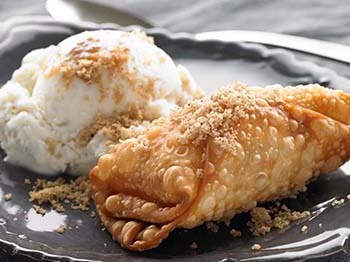 Pear Turon satisfies both of these trends with fruit, paprika and a customizable size. Combine brown sugar and paprika in mixing bowl. Set aside half for use in serving. Toss pears in remaining sugar mixture until well coated. Working with 1 lumpia wrapper at a time, place wrapper at an angle on work surface forming a diamond shape. Moisten edge of wrapper with water. Place 1 pear slice horizontally across middle of wrapper. Fold left and right sides into middle, and then carefully roll from bottom to top, starting at the lower edge. Repeat until all pear slices and wrappers are rolled. Coat bottom of large skillet with vegetable oil. Pan fry each turon in vegetable oil until golden brown on all sides. Drain, then dredge in remaining brown sugar mixture. Serve each with a scoop of vanilla ice cream.